Organic fungicide and organic insect repellant for your lawn and garden. Garlic GP AG Pro 3 is just the product organic farmers have been looking for...a powerful OMRI Listed Fungicide* with insect and pest repellant properties in a single, easy to use and safe product. AG Pro 3 becomes odorless and tasteless within hours. AG Pro 3 may be used on all plants - including vegetables, grains, tree fruit, grasses, ornamentals, roses, trees, shrubs, ferns, palms and flowers - to prevent fungal problems such as rust, downey mildew, powdery mildew and black spot. Preventive Application: Mix 6 oz. of AG Pro 3per one gallon of water and spray with aerial or ground equipment. Curative Application: Mix 12 oz. of AG Pro 3 per one gallon of water and spray with aerial or ground equipment. 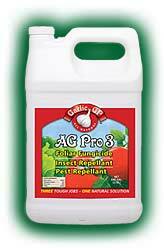 AG Pro 3 may be used on all plants, trees and grasses as a general insect repellant. Preventive Application: Mix 2 ½ oz. of AG Pro 3 with one gallon of water and spray with aerial or ground equipment (one gallon AG Pro 3 to 50 gallons of water). Works best before insect infestation. Curative Application: Mix 5 oz. of AG Pro 3 with one gallon of water and spray with ground or aerial equipment (one gallon of AG Pro 3 to 25 gallons of water). AG Pro 3 may be used as a general pest repellant in all agricultural areas. AG Pro 3 repels many pests including rats, mice, rabbits and more. Application: Mix: 2 ½ oz. of AG Pro 3 with one gallon of water and spray desired areas with emphasis on the perimeters (one gallon AG Pro 3 to 50 gallons of water). RID System. This bottle plugs into your irrigation system and the contents are mixed with water before being distributed by your lawn sprinklers. Since this organic fungicide and insect repellant works through your sprinklers, it evenly treats your whole yard with minimal effort. You don't have to tote around a heavy jug or strain to reach every spot.